Sometimes it can be hard to figure out what killed a particular of cattle, but not for Oregon farmer Grant “Buzz” Spriggs’ who caught a cougar attack in action. Spriggs captured footage of a mountain lion killing his pet goat Lilly March 24 on the 40 acres of farmland a few miles west of Benton County in Harlan. The property sits on the western edge of the Willamette Valley. In his 35 years there, he told the Corvallis Gazette-Times he’s only come face to face with a cougar once. “I wanted to see if it was a cat and if it was going to come back. Now I know this was a cat. And I know how often they come around,” Spriggs told the Corvallis Gazette-Times. Through strategically placed motion cameras, he’s captured images of cougars, coyotes, bears and bobcats before. Generally though, when one of his livestock vanishes he has no way of knowing what actually happened to it. 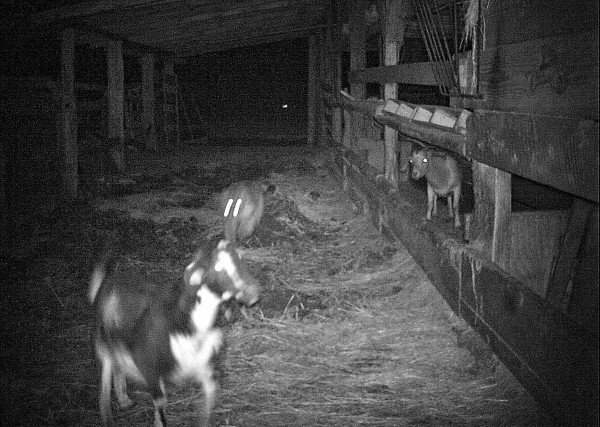 But after loosing one goat a couple days earlier, he trained a camera on the barn where the goats sleep. The cougar wandered in just before 9 p.m. on March 24. The camera inside the barn captured the cougar coming into the barn, attacking one of the goats and dragging it out of the barn and into the wooded area surrounding the farm. After nearly vanishing in Oregon in the 1960s, the population has surged to more than 5,000 statewide, according to state Fish and Wildlife officials. There have been no reported attacks of cougars killing humans in Oregon. Several farmers, including Spriggs, continue to advocate for more hunting of wild cougars in the area.